While what you say during your presentation is important, it's the collateral materials you provide that truly give your audience the full scope of what you're communicating. Impressive presentation folders showcase your inserts and prove invaluable for organizing them at business meetings, trade shows and sales calls. 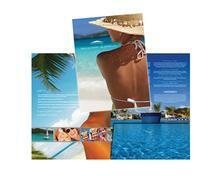 Impress your audience with high-quality, customized presentation folders from PCA Delta.